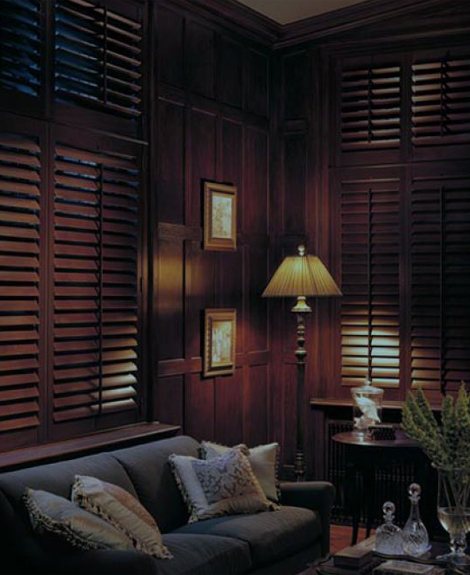 Dark wood shutters can offer the utmost in quiet seclusion for serious reading, relaxing, or working with no distractions. Notice how the wall paneling, window frames, ledges, and wood shutters tie in flawlessly. 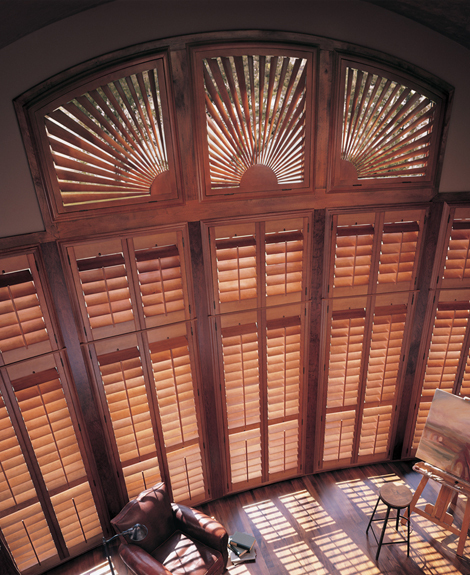 The bi-level look of the shutters allows the opening of the top level for natural light, while still assuring privacy. These wide open top windows will let in all the natural light you will need so feel free to close or tilt the slats of your shutters for privacy. At night, the ultra-modern wall mounted sconces will deliver illumination, and contrast nicely against the wood tone of the shutters and top window frames. Bi-level wood toned shutters (tri-level if you count the transom windows) are the perfect treatments for these studio/reading room windows. Let in a little light, a lot of light, or open the shutters wide for the full, captivating view. 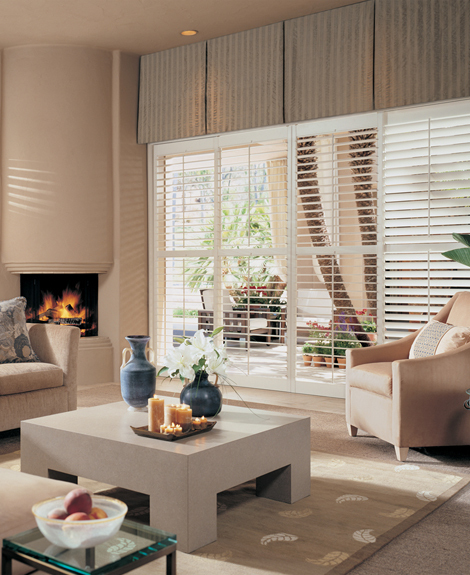 Even the starburst top window treatments are louvered for optional lighting control. 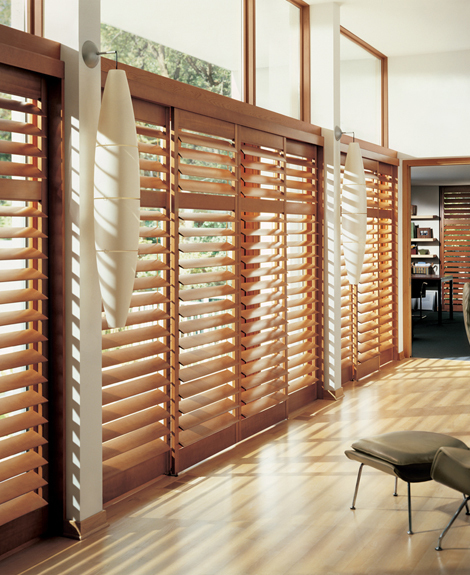 Never before have sliding doors had shutters like these. The treatments on the doors perfectly match the treatments on the rest of the full-length windows and custom fitted transom window shutters in the room. 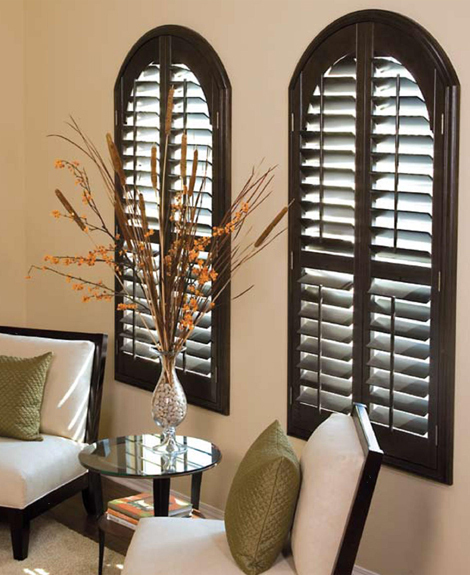 The sleek, clean lines of the shutters lend themselves to the simplistic look and feel of the room’s decor. This quaint, clean sitting area is the picture of perfection thanks to the slightly contrasting shutters which let in just the right amount of light, whether you are reading or reflecting. While the walls and chair cushions coordinate, the shutters and shades of the contemporary light fixture go together very nicely. 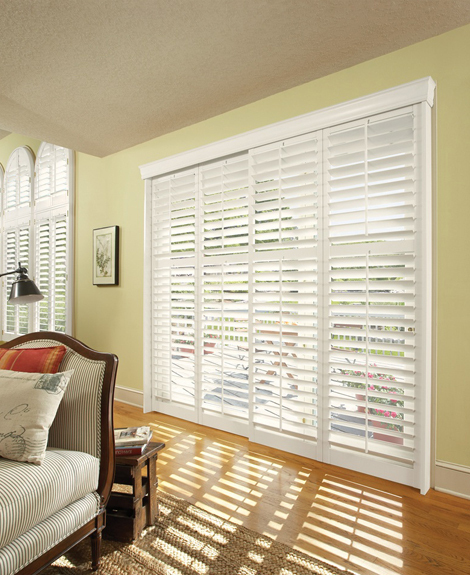 When not going back and forth from living room to patio and back again, close these light colored shutters to determine the amount of natural light or privacy that you desire. Match the color of these treatments to room furnishings, wall colors, or to bring out a color in the box pleated valances. 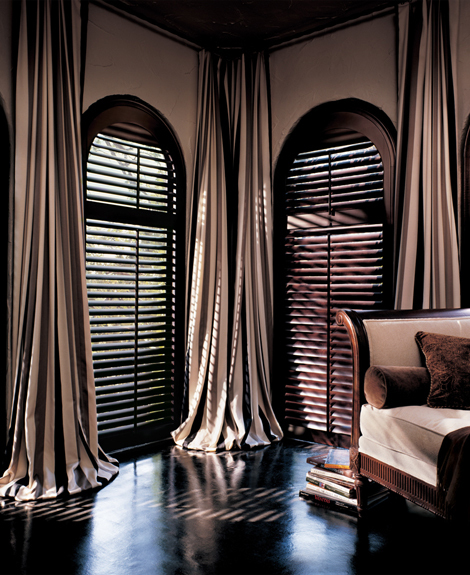 There can be no doubt that these dark wood shutters are custom fitted. Windows such as these would have given interior decorators of old nightmares for weeks. But today, window treatments like those you see here are perfectly crafted to match not only the style and size of the window but the frames and furnishings as well. Perfectly custom fitted, bi-level dark wood shutters coordinate with the wood tones of the floor and ceiling to tie the entire room together in a nice neat package. Floor to ceiling side panels pool lusciously along the bottom of this luxurious window treatment to add a touch of grandeur to the ideal reading room. 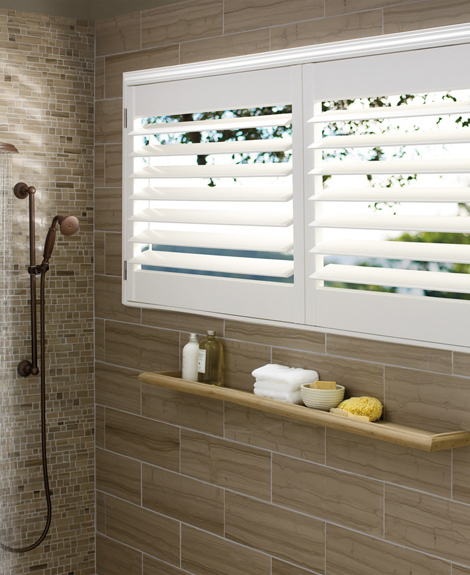 The clean, white lines of these shower room shutters fit in perfectly with the tiles and grouting offering a classic but simple look. For a feel of nature, and if you have no neighbors, open the right shutter for a true outdoorsy effect and maximum lighting. 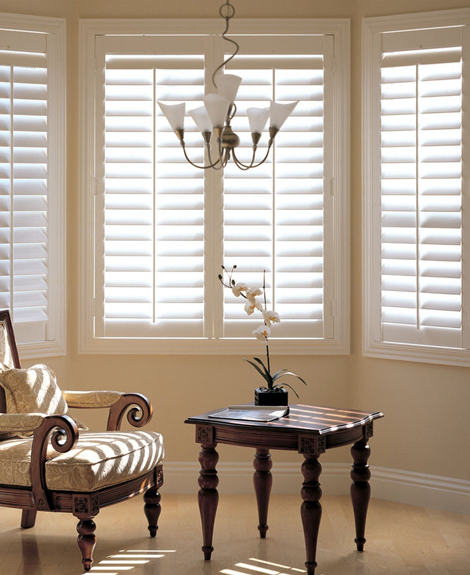 Choosing the right shutters means no cracking, discoloring, or warping.